'The Dark Knight Rises' is a epic summer blockbuster, a film aimed squarely at the masses, and it's ambitious, confident and unselfconsciously weird. I was anticipating this film so much that I was somewhat nervous - I've been burned too many times by hype (the Phantom Menace, Matrix Reloaded, Spider-Man 3 etc) and even though all signs pointed towards the film being amazing I still harboured some small doubt that Christopher Nolan could screw it up. I had tickets to the 1am showing at the Waterloo IMAX, so to refresh my memory I had a mini-Batman marathon throughout the day, catching up on Batman Begins and The Dark Knight. Both of these are excellent films, The Dark Knight particularly so, the bar isset pretty high. I'm pleased to say that I thoroughly enjoyed it, although it was a quite different film to what I had expected. The previous films in the series have tended to keep the action relatively grounded. The stakes were still high, but the action still took place in a recognisable version of reality. In this film, Nolan literally tears up the gritty streets of Gotham City, and imposes a far more bizarre world on top of it. Christopher Nolan has made a film with courage in its convictions, with a willingness to explore concepts to their logical, if at times bonkers conclusions. In a world of CG spectacles, Nolan's direction stands apart - there is a focus on physicality throughout all of his work, but especially here. In sequences involving vehicles he concentrates on their every interaction with the environment, when something explodes it never feels like an antiseptic blob of graphics - something has actually gone kaboom. 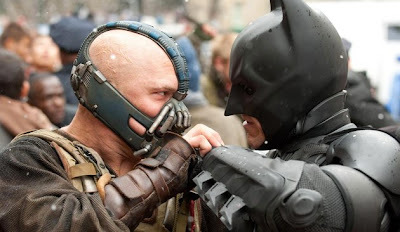 The physicality of the film extends to the interactions between the actors, the first Batman/Bane showdown is not only shockingly visceral in its brutality, it concentrates of the 'texture' of the beating too, with matt surfaces becoming wet and more primal. The cast is uniformly excellent, without any weak links. Actors like Gary Oldman, Morgan Freeman and Michael Caine are about the safest pairs of hands you can get, and inhabit their roles in much the same ways as they did in the previous films. Caine in particular gets more emotional range than before to work with to heartbreaking effect. The primary characters all take their roles to unpredictable and interesting places. Christian Bale unexpectedly shows us a fairly happy and contented Bruce Wayne for part of the film. There is a moment where he realises he's been locked out of his mansion, and his obvious pleasure in the novelty of this is not something you can imagine from the tortured youth of Batman Begins. I had been expecting the tortured, depressive, overly serious loner of the previous films to dominate here, it's fun to see him defy this and show us a curious, if somewhat emotionally sedated Bruce Wayne. Bale's physique has changed over the last few films, we see the effects of inaction and age on the overly cut beefcake of Batman Begins, rendering him still fit, but thinner, with hollow, gaunt cheeks. It's a nice way of getting us to feel sympathy for the man, as well as accentuating his vulnerability. 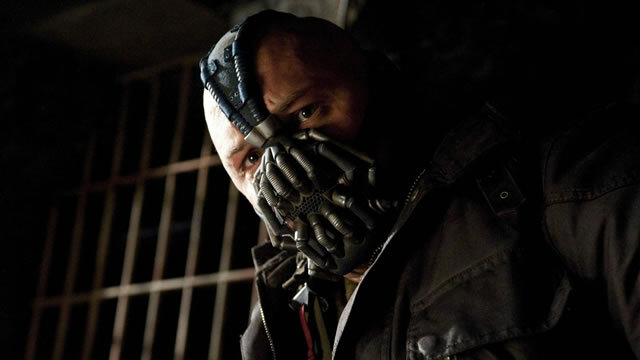 It's Tom Hardy's 'Bane' that's likely to garner the most attention. Combining brains and brawn seems to be an obvious thing to do to create a nemesis for Batman, but rarely has it been done with such originality and style. Much has been made of Bane's voice in this film, but I absolutely love it. Seeing this huge lump of muscle walking around spouting somewhat mannered yet intimidating dialogue sets off a nice disconnection in the audience. In terms of his looks, he appropriates a militaristic revolutionary chic, with a hint of the aristocratic country gent in his sheepskin coat. The one moment that stands out is when he gently caresses the cheek of someone who's trying to threaten him. The man angrily says "I'm in control!" Bane softly replies, "Do you feel in control?". He's not showing off or being egotistical, the way he understates his obvious dominance over the situation underlines how scary he really is. In this mix, Anne Hathaway's Selina Kyle (I don't think she is referred to directly as 'Catwoman' in the film) doesn't quite get the screen time that her performance deserves. This film is nearly 3 hours long, but doesn't waste any time. Even so, of the three leads she gets the least development. This is a shame, because she gives an interesting performance, playing a character who's weaponised femininity for her own ends. There is a contradiction at the heart of her character, she is an individualist, yet one who frequently adopts different personalities (the submissive maid, the hysterical victim, the seductress) to achieve her ends. She is completely in control of her own identity, yet is also trapped by it, trying to find a way to erase her criminal record and lead a normal life. It's a nice contradiction, but we only really explore the surface of this idea - this is a film where character's pasts are vitally important and apart from knowing that she's got a criminal history we know very little about her. Despite this, Hathaway neatly fills the role with a dangerous, lithe charisma - it is easy to see what attracts Bruce Wayne to her. Joseph Gordon-Levitt's John Blake, on the other hand has far more screen time - and somewhat simpler motivations. He's slowly and gradually built up as Batman 2.0, and while the need for this concept is fundamental to the themes of the film, we possibly spend a bit too much time with him. Gordon-Levitt is one of my favourite actors, improving almost every film he's in with his charisma - but John Blake is a fairly cliched and simple character - the hero policeman with a 'hot head' but a heart of gold. We are repeatedly shown what a fundamentally good person he is, his fixed moral centre, his unhappiness at using guns and his willingness to act on his own initiative. But all of this set up is for a payoff that takes place after the film finishes. We see him discovering the Batcave, and assume he's going to be a good Batman, but that's about it for payoff. Stockbroker: This is a stock exchange. There’s no money here for you to steal! Soon after Bane takes over we are shown the proletariat of Gotham literally dragging the rich out of their houses and stripping them of their luxury possessions. After the economic crimes committed by the wealthy it's difficult to sympathise with them as victims. I felt a slight disconnect here - was I was supposed to be cheering Bane on at this point? But Bane himself is being bankrolled by the elite of Gotham, and his people's revolution is explicitly shown to be a sham with the ultimate aim of destroying the city. There are valid readings of Nolan's Batman series as being about the importance of maintaining the Western capitalist status quo. I don't see the politics of this film as being so clear cut - the series has been fairly clear about showing us how inequality in society leads to criminality. I do find some of the imagery problematic though, it is hard to swallow the sequence where the policemen of Gotham square off in open warfare with the freed prisoners running the city. Throughout the rest of the series we have had it hammered home that the GCPD are unavoidably corrupt, and now we are expected to see them as noble heroes fighting these prisoners, who are painted as scum to a man. The 'Dent Act', that has apparently cleaned up the city is never explained to us, but there are hints that it is restrictive of civil liberties. In the climax of The Dark Knight Nolan shows us the prisoners on the ferry as more noble than we'd assumed - refusing to act selfishly in sacrificing the lives of civilians for their own. The film is on shaky ground here, and seems to have conceded some philosophical ground for the visual impact of a street war between two easily identifiable sides, one good, one evil. For me, the film's success lies away from its somewhat confused politics, and with its summation of the philosophical and societal importance of symbols. The previous films in the series take pains to 'ground' the Batman mythos in reality. Batman Begins in particular takes painful care to justify just about every aspect of the character, from his motivations to his costume, while The Dark Knight serves as an examination of what the longer term effects of Batman would be, and ends rather pessimistically with our hero taking the fall for multiple murders. This, coupled with the rather grim trailers and advertising campaign seems to set the film up as the ultimate in grim, realistic, somewhat depressing reality, this time we're going to see Batman get his face pushed into the mud by the big bully Bane. And we do. But this isn't a cynical film, one that underlines exactly how flawed the character is, it's one that takes these grim, depressing elements and systemically goes about 'curing' them. It's an exorcism of the Batman, outlining his flaws and showing how to fix them, all the while underlining the central thematic continuity between the films; the power of symbols. All good superhero films tend to set their heroes against a warped aspect of themselves. That's why Spider-Man tends to fight against tragic scientists who accidentally gain animal-based superpowers, why Superman fights fascist kryptonians and so on. Nolan clearly understands this, and all of the previous villains have been reflections of aspects of Batman. Scarecrow took Batman's tactics of fear to an impersonal and unbalanced chemical conclusion. Ras al Ghul was a megalomaniacal surrogate 'dark' father figure. The Joker was the chaotic and unpredictable reaction to a man with a fixed moral code. Two-Face was a demonstration of how a man that's suffered massive personal tragedy can fall into murderous, evil revenge, as opposed to Batman, who used his tragedy to mould himself into a figure for justice. So what of Bane then? Bane encapsulates almost all of these themes and more. This film is an apocalypse, and he is the antiBatman. Contrast their outfits, Bane's is the inverse of Batman, his armour covering only his mouth, as opposed to the mouth being the only exposed area of Batman. Batman is a creature of stealth and shadows, while Bane marches around in daylight in front of huge crowds making speeches. Batman has a gruff, growling affected voice, Bane's is cultured, effete and aristocratic. 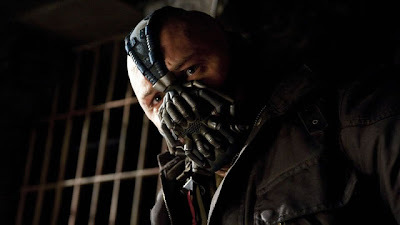 Batman rejected the League of Shadows, Bane was rejected by the League of Shadows. Whereas Batman uses the city itself as a weapon, Bane tends to stamp upon it. What is Nolan trying to show us here? Throughout the film, Bane is portrayed as scarily competent, explicitly outlining his plans and effortlessly executing them. He seems unstoppable, an inexorable force rolling over Gotham City like a steamroller. When he and Batman face off for the first time, Batman gets effortlessly ground into the dirt by Bane, who mocks him throughout. None of Batman's attacks have any discernible effect upon him, not his hard, furious punches, not his gadgets and not his stealth. Bane ends the fight by relentlessly pounding Batman's mask, a symbolic smashing of the Batman identity. They fight later during the climax, without Batman using any dramatically different tactics, and this time it is Batman who is triumphant. Why? What changed? 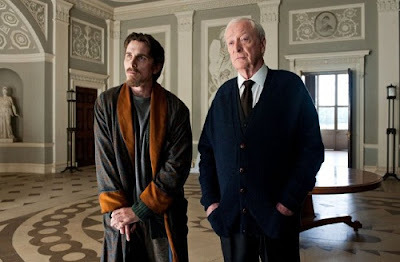 "People need dramatic examples to shake them out of apathy and I can't do that as Bruce Wayne. As a man I'm flesh and blood, I can be ignored, I can be destroyed, but as a symbol I can be incorruptible, I can be everlasting." 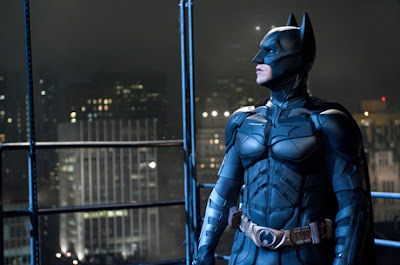 He's absolutely right, in The Dark Knight Rises we open to a Gotham City that's essentially free of crime. The 'Dent Act' has allowed the police to crack down on organised crime, a piece of legislation that's only been possible to enact through the lie of Dent's martyrdom constructed by Commissioner Gordon and Batman. In taking the blame for the murders Dent committed and becoming a symbol of the danger of vigilantism and the importance of an incorruptible legislature Batman has done more good for the city as a idea than he ever did as a guy in body armour punching people in alleyways. Doctor: No, that's because there is no cartilage in your knees. Scar tissue on your kidneys. Concussive damage to your brain tissue. I cannot recommend that you go heliskiing. In this shot we look down upon a slightly nervous, seated Bruce Wayne - he seems a little lost and childlike in his optimism, but again, not particularly angry about it. He seems to have accepted that this is the price he's had to pay for apparently succeeding in his mission as Batman. This serenity doesn't last for long though, a Batman film featuring a happy and relaxed domestic Bruce Wayne pootling around his house isn't going to put bums on seats. Soon after this, he's back in the suit, but unbeknownst to him causing far more damage than harm. 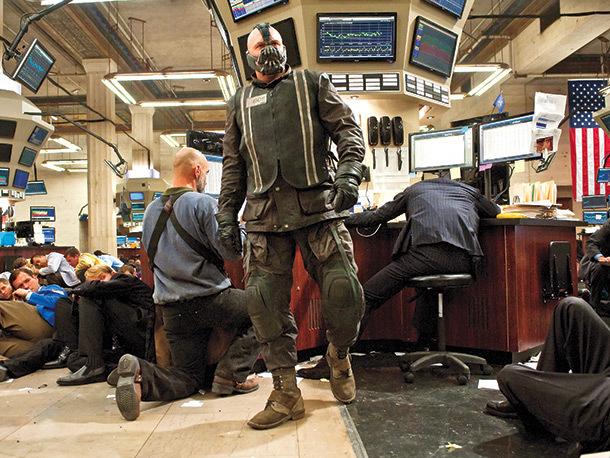 The idea has over-taken the man, and his very presence distracts the police to such an extent that Bane manages to escape from his raid on the stock exchange. Batman doesn't know it yet, but the ideological balance of power has shifted. Before we know it, Alfred has left him, Bane has stripped Bruce Wayne of his wealth and he's been betrayed, suffered massive injuries and been dumped in a big hole in the desert. Bane, meanwhile has seized power in Gotham through a display of overt force, exposed the lie of Two-Face, opened the prisons and is maintaining martial law by using (among other things) versions of Batman's own Tumbler 'Batmobile' to keep the citizens quelled. Bane's revolution seems be a blunt extension of Batman's own burgeoning fascistic tendencies towards the end of The Dark Knight. Whereas Batman 'merely' illegally wiretapped the population of Gotham to defeat the Joker, Bane is far less subtle and directly imposes his will on the citizenry. This perfectly ties in with the two men's tactics, Batman subtle and covert, Bane obvious and overt. 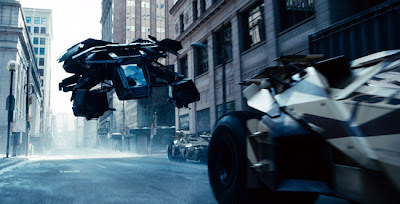 It is possible to imagine Batman going completely off the deep end and enforcing martial law over the city using a fleet of Batmobiles to cow people into behaving the way he feels they should. At this point in the narrative, Bane has comprehensively out-Batmanned Batman on nearly every conceivable level. So how does Bruce Wayne come back and save the day? What is that gives him the power to climb out the hole he's been thrown in and save the day? Well, much like another character from a great comic book film, Batman must earn the power of self-respect. Nolan shows us this through extremely straightforward symbolism. Bruce Wayne must climb out of a big dark hole into the light. There's a rope that looks like it's aiding him, but this is an illusion, and this connection to the dark is holding him back. It's only when he severs this link, realising that he values his life, that he has many people that care about him and that he needs to get over his own insecurities that he succeeds. From this point on, he quickly seizes control of his own symbology back from Bane. He begins by lighting a huge flaming Batsignal over the city, asserting the notion of the 'light' as his own over Bane. He then trumps Bane's fleet of ersatz Batmobiles with his more intimidating flying 'Bat' vehicle. He sets in motion plans with his network of friends, expanding his influence. This time when he fights Bane, he's got the ideological upper-hand, and before we know it, Bane has become just another big thug to be dispatched. Much of the power that Bane wields comes from his aura of invincibility. His backstory as the 'one man to climb from the pit' seems to be common knowledge - setting him apart from other men. The film literally strips this back-story away from him and transfers it to others - this time Batman has co-opted Bane's myth. With Bane's true motivations revealed and his power as a symbol stripped away he is broken, and is unceremoniously finished off with a blast from Catwoman. At this point, Batman is ideologically triumphant, but the ghosts of his past still haunt him. The legacy of Ra's al Ghul lives on in the form of a ticking nuclear bomb. If these films have been about the power of symbols then we know there is but one way for Batman to defeat this ghost - he must sacrifice himself to save the city. Whereas Harvey Dent was an illusory martyr, Batman must become a genuine martyr. And he does, flying off into the sunset and exploding in a nuclear blast. His status as a symbol is now unimpeachable, shown by the city erecting a statue of Batman in honour of his memory. He has finally achieved his ambition of becoming a legend, of being more than a man. Batman is conclusively dead, but thankfully Bruce Wayne has survived, and is leading a truly happy, carefree life with Selina Kyle in Europe. Is this a cop out? Would the film be more powerful if Bruce had indeed sacrificed himself. From a certain perspective this 'lie' is another version of the fake martyrdom of Harvey Dent. It's more than that though, in truly transforming Batman into legend Bruce Wayne has finally succeeded in disentangling himself from his creation. Batman is dead. Bruce Wayne is now a healthy, well-balanced and happy individual. Yet although his demons have been exorcised, the concept of Batman lives on. Someone, somewhere needs to work out their own demons and so John Blake takes up the mantle. Batman is dead! Long live Batman! I wasn't quite as enthusiastic. The end should have been cut where we see Alfred's smile. We didn't need to see Wayne then. Would have been a much more open-ended finish, especially as we earlier learned that the auto pilot on the Bat had been fixed. Too much set up for another film, ambiguous end, Selina Kyle (no need for her in this) and surely John Blake will be Robin (he was even told by someone that they preferred his real name “Robin“). So, very enjoyable but too long (and with constantly intrusive music) the studios got to Nolan in a way that didn't happen for the first two films of the trilogy.